Happy 2009! I hope you have a Happy, Prosperous and Creative New Year! To create my card I used the Createx Creations for my Background, substituting Createx with my Adirondack Paint Daubers - in Red Pepper and Gold. I used my JustRite Times New Roman Font (50 pt.) and my Harmony Rectangular Stamper Set for my sentiment - staggering the letters on my block then gold embossing them on my black card stock. To create the medallion, I placed my "2009" from my Times New Roman Font onto my JustRite Luxe Stamper, used my Small Letters to create Happy New Year, stamped on my Gold card stock in black, then clear embossed. I layered this onto my Black and Gold Scallop piece then onto my base card. What better way to start off 2009 - than with some Blog Candy! To enter just leave a comment on this post by 11PM CST on Sunday, January 4th and you'll be entered into a random drawing to receive the Damask Borders Monogram JustRite Stamper Kit. Be sure to check back on Monday, January 5th to see if you've won! Happy New Year to you! I love your card - thanks for the opportunity to win some fab candy! Happy New Year! What a great card - thanks for the opportunity to win the monogram border! Beautiful card! Love those borders and appreciate the blog candy offer! I love your card and I want to say Happy 2009 to you and those you love. 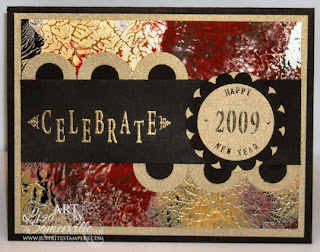 Please enter me in the Blog Candy giveaway, and I hope everyone has a stampin' happy new year! Wow, this background is fabulous! I will have the check this technique out. Hope you have a wonderful 2009 my friend! Lisa, Happy New Year to you too. Great card, I like the use of dabbers - that is a good idea. I love Just Rite stamps - I would love to win this! Thanks for the fun and inspiration! Very pretty card. Hope you have a great 2009 and that you achieve what you wish for in the stamping world. Beautiful Card.....of course would love to win. Happy New Year to you. I love how you staggered the letters. I just ordered the wood rectangle block so I will have to remember this when it arrives! Wow, that background is amazing! I love your colors! That is a great card! I have been enjoying your blog and projects a lot. Excited to see what you come up with this year! And thanks for the chance to win your blog candy! Happy New Year. What a great card. I'm loving the technique as well. This is scrumptious! Love it! Thanks for the chance to win! Happy 2009 Lisa. Can't wait to see what you create this year. All your cards and projects are great. Thank you for a chance to win some blog candy. WOWSER! I love this background. Please enter me for the blog candy. Just wonderful, Lisa! Sounds like a lot of work to create the stamping part! Thanks for all the ideas that you share! Happy New Year! I haven't had the opportunity to use JustRite products. Thanks for the chance to win. Happy New Year. Beautiful card, what a great way to start off 2009. Thanks for sharing your art with us, I get so much inspiration from your blog. Lisa, As always your working is amazing. Happy New Year, may it be a good one. Thanks for the opportunity to win Blog Candy. Happy New Year. Thank you for all the inspiring ideas you have shown us on your blog. May the next year be filled with more creative ideas!! Beautiful background. Love the effect. Beautiful card! Happy new year to you. Thanks for a chance to win the JR sstamp set! Happy New Year, and what a beautiful card to begin 2009! I love the colors! Happy New Year! I love the effect you made on the card. Thanks for the opportunity to win. I love your card! Happy New Year to all. Fantastic card!! I am new to your blog(within the last two weeks) and am having a blast checking out your previous posts. Thanks so much for the creative inspiration. This is really pretty, Lisa! You really rock the Just Rite stampers!! Happy New Year!! Such a pretty card!! Thanks for sharing! And Happy New Year! Very cool card. BTW, I love the purples in your blog header too! Would so love to win those monogram stamps! Happy Stampin' New Year! Lisa- Happy New Year! I love your New Year card. Thanks for all you do for us Technique Junkies and for all for the daily inspiration in my e-mail mailbox. The card is beautiful. I love your blog and all your irdeas, Your so creative Wishing you a Happy New Year !!!! Another gorgeous card Lisa. Thanks for all you do for TJ'ers!! Hope you and your family have a fantastic 2009!! I've seen those justright stamps on shows but never in real life, what a super blog candy!! Happy New Year Lisa! I really like your new blog look! Your card is fabulous! I love that all your cards have such great techniques used! Thanks for the opportunity for some wonderful blog candy! Enjoy reading your blog! Thanks for offering the blog candy. Really pretty card! Happy New Year...I am so looking forward to the inspiration that we all get from blogs like yours and I am sure that 2009 will be no exception! The colors and texture are amazing. Would love to see it in person. Thanks for continuing to share your unending talent. All the best in 2009! What a rich, luxurious card! And Whoo hoo for candy! Happy New Year!! Thanks for the chance to win some JustRite stamps. I love them and want to get that set. Maybe I'll be lucky!! the card looks like new years fireworks in the night sky. would love the chance to win the blog candy! Happy New Year! Wow this is one AWESOME card. I just love the background and the colors. Thanks for a chance at this sweet candy. I don't have any of the kits yet, but have seen a lot things made with it. Thanks so much for the great blog candy. What a great New Years gift that would be to win! great card and what great blog candy too Lisa!! i got my first set of just rite stamps and i love them and want more...your card is beautiful....thanks for sharing it with us...and i so want to win some blog candy!!!!! What a nice card to start the New Year! Thanks for the opportunity to win some blog candy! Happy New Year! Happy New Year... Great card I really enjoy your blog.. I have been drooling over the Just Rite products ever since I discovered them. Wouldn't that be a great way to start the New Year--winning some blog candy?!?!?! Happy New Year to you and your loved ones and may 2009 bring you many blessings. Happy New year!! Great blog candy - thanks for always sharing on your blog with us! Love this tech and the results on your beautiful card. Thanks for the chance to win some Blog candy! thx for sharing. very nice. love the blog candy too. I just love the background and I check your blog quite faithfully. Thanks for a chance to win your blog candy which I would really like. Happy New Year ! Love your work, it's always so inspirational. Love your card and Just Rite Stampers. Thanks for the opportunity to win the blog candy. I just ordered my first items from JustRite yesterday. I am looking for ideas and yours are great! TFS! I have never won any Blog Candy, but this would be a terrific way to start. Love your work. Great card, Lisa. I will have to try one of those backgrounds. Thanks for the chance to win the Just Rite stamp -- have so managed to hold off purchasing one of these but see some great samples using them. This is the most gorgeous background I have ever seen. Thank you for the opportunity for some blog candy. I'm fascinated with all the possibilities of the Just Right Stamp products and systems. I've been watching them for awhile and would love to play with them when the time is right(mean old budget!). The damask & harmony titles alone had me scrambling to look at the sets. And your ab/fab card background boggles my mind. I would love to float a scripture verse on some of my handmade paper right on top! With the technique you used would it work to run the background piece through a narrow strip shreader (horrors I know)and then weave them back together in a modified basket weave design? Happy New Year to you and your family! Thanks for sharing all of your fabulous Just Rite creations with us over the past year. Your Card ist wonderful. I really like your Background and the Colours. Beautiful idea and great card, I love the background. Thanks for the chance to win and all the ideas you provide. Fabulous card, Lisa! The background is stunning! Spectacular card, Lisa! Wish I had the time to learn some more of these great background techniques you use! Is this background awesome, or what?!? Wow! It's a stunner! Thanks for the chance to win the blog candy, too! You're SWEET!!! I'd love to experiment with the Just Rite stamps!! !